Walter Melville Wills, the multi-millionaire tobacco magnate, lived at Bracken Hill – see Chapter 39 – on the Somerset side of the Clifton Gorge. He also used his estate office – on the opposite side of the road, and overlooking the Gorge – as a ‘holiday house’. This was known as ‘Rayne Thatch’, and he commissioned James Pulham and Son to landscape the gardens. 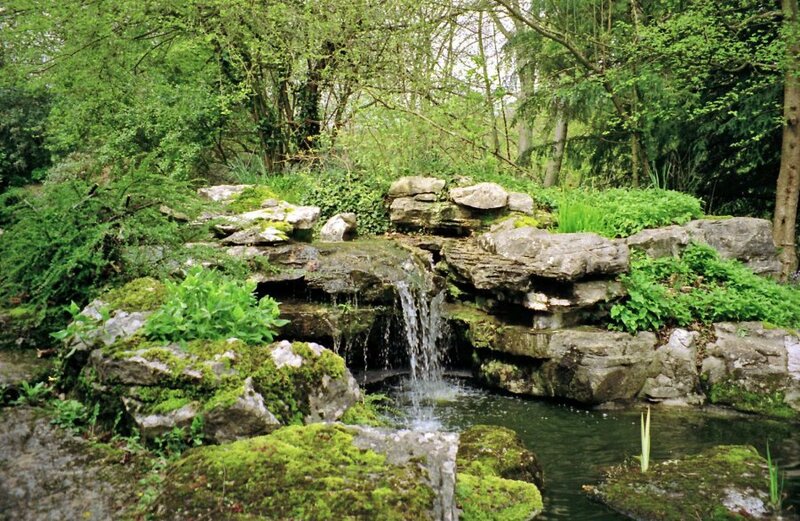 The Foreman in charge of the project was my grandfather, Frederick Hitching, and I am proud to say that this must be one of the finest Pulham gardens to be found anywhere. It is built around five pools at different levels, linked by water cascading gently down from one level to the next. The second pool was built specifically as a swimming pool, graded from ‘deep’ at one end to ‘shallow’ at the other, and has a grotto boathouse at the deep end – farthest from the house – with a grass-covered patio above for sun-bathing and diving. There is a narrow ‘rock-lined’ gorge between the swimming pool and the road that is nearly 9-ft high, and a rocky archway and pump-house on the side overlooking the Gorge. The kitchen of the house overlooks the ‘Lower Pool’, and there is an inscription stone near the entrance bearing mr grandfather’s initials and date of ‘F H 1910’. A full description of the work done by James Pulham and Son at ‘Rayne Thatch’ – together with a number of pictures – can be found in Chapter 31 of Rock Landscapes: The Pulham Legacy – the critically-acclaimed and lavishly illustrated definitive story of the lives and work of James Pulham and Son. Written by Claude Hitching, with featured photography by Jenny Lilly. Published by Garden Art Press. Posted on October 5, 2014 June 30, 2016 by Claude HitchingPosted in Book ContentsTagged . . James Pulham and Son, Claude Hitching, grotto boathouse, inscription stone 'F H 1910', Rayne Thatch - Bristol, Rock Landscapes: The Pulham Legacy, swimming pool, Walter Melville Wills.